Liposuction (or suction assisted lipectomy) is a surgical technique to remove unwanted deposits of fat from specific areas of the body. It is not a substitute for weight reduction, but a method for removing localized deposits of fatty tissue that respond poorly to diet and exercise. Liposuction may be performed as a primary procedure for body contouring or may be combined with other surgical techniques. The best candidates for liposuction are individuals who are close to their ideal weight and who have excess fat in particular body areas. Having firm, elastic skin will result in a better final contour after liposuction. Skin that has diminished tone due to stretch marks, massive weight loss, or natural aging will not reshape itself to the new contours and may require additional surgical techniques to remove and tighten excess skin. Body-contour irregularities due to structures other than fat cannot be improved by this technique. Generally, patients with a skin pinch thickness of 3cm or more in a particular area will benefit from liposuction. Liposuction by itself will not improve areas of dimpled skin known as “cellulite”. Fat deposits are divided by the superficial fascia into superficial and deep layers. The superficial layer lies under the skin and the deep layer is just above the muscles. In some areas the superficial fascia is fused to the muscle fascia, and only superficial fat deposits exist. There are vertically oriented fibrous arches called the retinaculae cutis which divide the superficial fat into discrete pockets. The fibres extend from the deep surface of the skin into the superficial fascia. (See Diagram). The deep fat has more horizontal separations. When fat enlarges in the superficial layer, these discreet pockets enlarge and begin to bulge. Their expansion is ultimately limited by the surrounding fibres and top of each pocket balloons out much like a parachute. As this occurs just under the skin surface, bulges (caused by underlying fat accumulation) and dimples (caused by the tethering effect of the fibres) are noted on the skin surface and this is termed cellulite. Why are some areas of fat so difficult to get rid of? Most people are unaware that fat is some areas is biochemically different to fat elsewhere. Generally the superficial fat has Beta-1 receptors and is more “metabolically active” and can be reduced with diet and exercise. The deeper fat over some areas, such as the inner and outer thigh, buttock, lower abdomen and lateral flank (love handle) is predominantly endowed with Alpha-2 receptors which make these areas more “diet resistant”. These reserve fat areas are also more sensitive to circulating glucose and tend to accumulate fat rapidly and release fat slowly. The number and type of receptors on various fat cells is genetically determined. The operation is performed under either general anesthesia (for larger volumes of multiple areas) or local anesthesia and conscious sedation (for small volumes and limited areas). In either case, physiological fluid containing local anesthesia and adrenaline is infused into the tissue. The a hollow metal surgical instrument known as a cannula that is inserted through small skin incision(s) and is passed back and forth through the area of fatty deposit preserving the larger neuro-vascular connections to the skin. The cannula is attached to a vacuum source (a pump or a syringe), which provides the suction needed to remove the fatty tissue. There are a variety of different cannulas and techniques used for liposuction and methods of aftercare. I personally use “Mercedes” cannulas and pump assist, with a wet technique. What is the difference between wet, superwet and tumescent techniques? 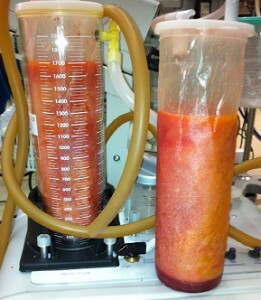 Most modern liposuction techniques use the infusion of anaesthetic containing fluid for both pain control as well as to limit blood loss. The “Wet” technique was advocated by Illouz, who pioneered liposuction. This involves infusion of modest quantities of fluid. “Superwet” technique is an evolution of the “wet” technique where larger fluid volumes are infiltrated – up to 1ml for every planned 1ml of fat to be aspirated. “Tumescent” technique was advocated by Klein, who infused significant volumes of fluid until the tissue turgor increases and peau d’órange is noted on the skin surface. Infusate to aspirate ratio = 3 – 6 : 1are not uncommon. I personally utilize the wet (and occasionally the superwet) techniques as these have proven safety and efficacy. I have noted that in general, the blood represents only 5-7% of the aspirated volume. I never exceed the maximal safe dose of local anaesthesia. How much can removed at one time? The American Society of Plastic Surgery (ASPS) has published a practice guideline that recommends that no more than 5000ml of aspirate be removed at one time. This maximal volume limit allows liposuction to be performed with minimal risks to the patient. As the 5000ml mark is exceeded an exponential increase in the complication rate has been well documented. Although there are many plastic surgeons who exceed this threshold, I am unwilling to compromise on patient safety and do not exceed this myself. For procedures which are performed under conscious sedation, the volume is much smaller and I seldom exceed 750ml. Generally, an aesthetic end-point is a 50% reduction in the skin pinch thickness. What about energy assisted liposuction? I have tried almost all the available assisted techniques, including laser liposuction, VASER and power assisted liposuction (PAL) and have not noted significantly increased results or comfort. Despite trying all these techniques I have reverted back to the standard liposuction technique as it continues to offer safe and excellent results and a level of finesse that other devices are yet to achieve. What post-operative care do you recommend? All patients requiring high-volume liposuction will need to be done under general anaesthesia and spend overnight in hospital for fluid monitoring. At the conclusion of the procedure, I place the patient in a specifically designed medical compression garment (Marena Garment). The compression garment is worn for 23/24 hours for 6 weeks continuously. This helps to get rid of swelling and to allow the skin envelope to adhere to the underlying tissues in the most aesthetic way. I consider this an absolutely indispensable step in the success of the procedure. Normal activities of daily living are allowed after 2 weeks and exercise may only resume after 6-8 weeks. Immediately after the procedure, the patient may note a pleasing result, but as swelling occurs, this may be less noticeable. The compression garment does effect a degree of “shaping” during the early post-operative period, but patients should allow at least 12 weeks post-surgery before assessing their new contours. Generally, if the patient has a good diet and exercise plan in place, continued improvement for 1 year is the rule. It is not advisable to consider any surgery in the area for at least 1 year to assess the final result. Is it true that fat can return after liposuction? Yes. Fat tissue contains more adult stem cells than bone marrow. As some fat is left behind (and should be left behind to prevent contour deformities), some of these stem cells will remain behind as well. If the patient does not adhere to a reasonable diet and exercise program, fat will again start to accumulate and while it initially accumulates in the non-operated areas, eventually the stem cells will multiple and create new fat cells and these will also enlarge. It is thus absolutely critical to the final result for patients to have a plan in place.